Customers experience all aspects of their relationship with a brand through the lens of their emotional state. Be they happy, excited, depressed or angry all brands must be prepared to meet each customer in their specific emotional state. It’s a challenge – but also an opportunity. Ultimately, loyalty is emotionally driven. Brands that can react to and manage customer emotions stand to reap the rewards of customer loyalty. To understand the role of the customer’s mood in managing the customer experience, it is instructive to consider how two affective states work together to define mood. 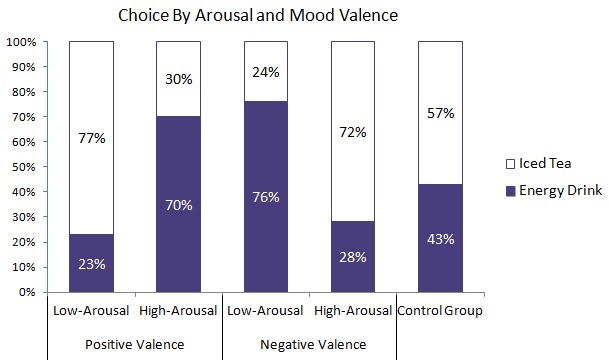 The following model tracks mood across valence (the extent to which the emotional state is positive or negative) and arousal (the extent to which the energy mobilization of the emotional state is experienced on a scale of active to passive or aroused to calm). Together, these affective states of valence and arousal can define all human emotions. States of positive valence and high arousal are excited or happy; negative valence and low arousal are bored or depressed. States of positive valence and low arousal are calm and relaxed, and negative valence and high arousal are angry or frustrated. 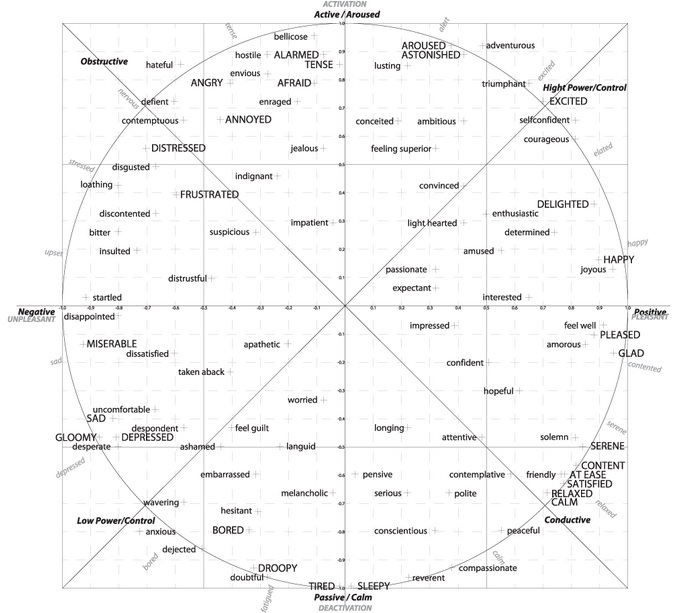 Here is a detailed map of a variety of emotions across these two dimensions. Research has determined that, not surprisingly, people are motivated to maintain positive moods, and mitigate negative affective states. When feeling good we tend to make choices that maintain a positive mood. Customers in a positive mood are more loyal, and more likely to interpret information favoring a current brand. Meanwhile, people in negative affective states make choices that have the potential to change or, in particular, improve their moods. For example, researchers have demonstrated a preference for TV shows that held the greatest promise of providing relieve from negative affective states. People in a sad mood want to be comforted, anxious people want to feel control and safety. Participants in a positive mood, preferred the drink congruent with their level of arousal, those in a positive low-arousal state preferred iced tea, and those in a positive high-arousal state preferred an energy drink. On the other hand, those in a negative mood preferred a drink incongruent with their energy state, those in a negative low-arousal state preferred an energy drink, and those in a negative high-arousal state preferred iced tea. Understanding the role of arousal management in customers’ innate desire to maintain positive moods and mitigate negative moods has far reaching implications for just about every element of the customer experience from sales, to problem resolution, to customer experience design, hiring, training and customer experience measurement. In future posts we will explore these implications for each of these elements of the customer experience.